Cormac Hogan, Senior Technical Marketing Architect for Storage at VMware, wrote a 30-page PDF document titled ”Virtual SAN Design & Sizing Guide”. VMware Technical Marketing and VMware Technical Publications. The document is also publicly available in the VMware VSAN Public beta. Sign up here. Registration is open for everyone interested in this new technology. 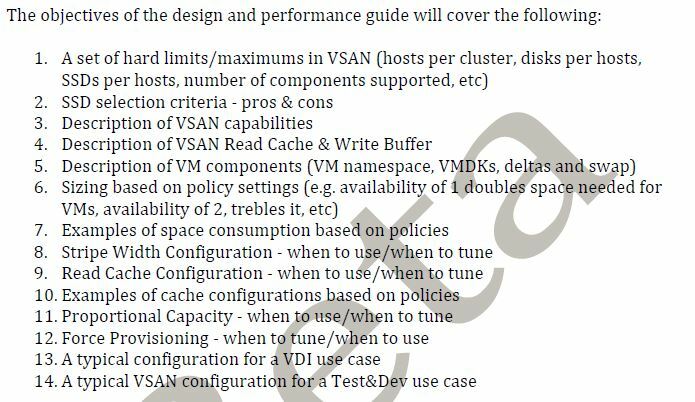 The design and sizing guide is part of the VSAN POC Kit. This Proof of Concept (POC) Kit contains 4 documents to help you to successfully evaluate Virtual SAN (VSAN) and gain an understanding of the considerations which must be taken into account with a VSAN deployment. It also covers the main concepts of VSAN, notably the radically simple installation steps, the scale out aspects and policy driven storage. Download the kit including the Virtual SAN Design & Sizing Guide here.